Murderous Maths: Sept 19th - The Day of the Huntrodds! September 19th - The Day of the Huntrodds! 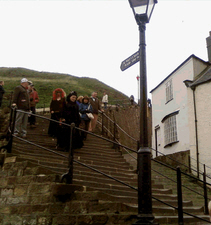 For any maths fans visiting the town of Whitby in North Yorkshire, England, there's a very special treat! Perched on the cliffs high above the town are the ruins of the Gothic Abbey. 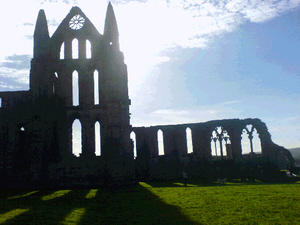 To reach the Abbey you need to climb the famous 199 steps that were featured in Bram Stoker's novel "Dracula". Watch out for who you might meet as you go up! 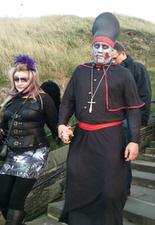 Although the ruins are spectacular, the other church that shares the same cliff top has its own little-known secret. 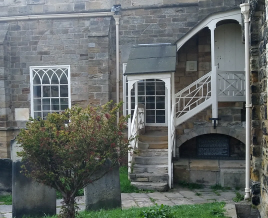 The front of St Mary's Church looks out over the harbour and North Sea, but tucked around the back is a wooden staircase that leads to a gallery inside the building. Nestled underneath the stairs is a small stone arch that guards a very curious gravestone. The inscription is almost worn away, but a plaque on the back of the wall tells us what it says. If you're a maths fan, you'll love it! Let's pick it apart and look at the sums. They were both born on Sept 19th 1600. The chances of sharing their birth month and day are 1/365, but also factoring in the same year, we'll generally assume people getting married are born within 10 years of each other. Therefore the chances of exactly the same birth date for both of them is 1/3650. They were married on the same date. Again this should be a further 1/365 chance, although it may be that they picked the day to coincide with their birthdays? Sadly there's no way of asking them, but of course this massively reduces the chances. Let's say this chance is reduced to 1/10. 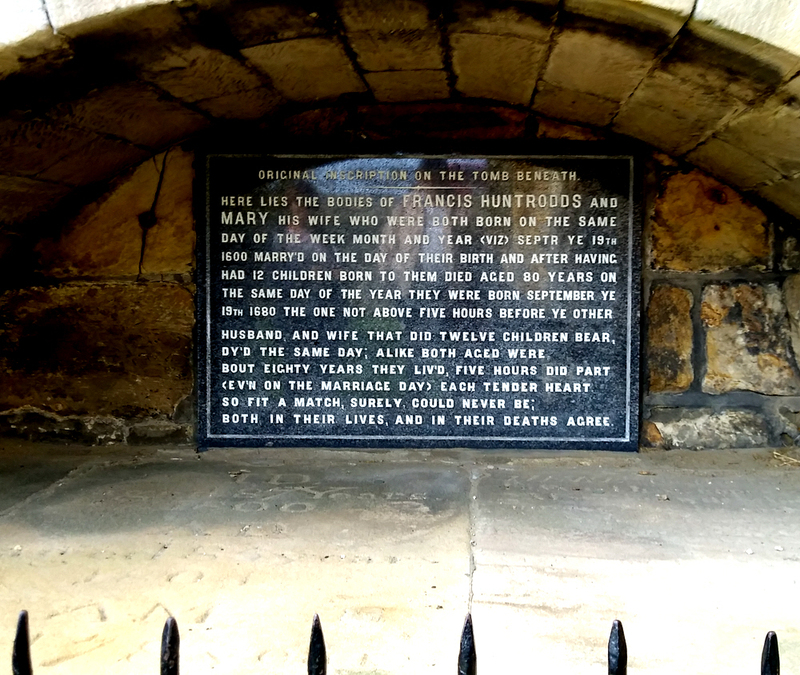 They both died on Sept 19th 1680. This is the weird one! The chances of Francis dying on any Sept 19th are 1/365. The chances of Mary also dying on Sept 19th are a further 1/365, plus we have to factor in the same death year as her husband, so as above, let's say she was likely to die within 10 years. Therefore the chances of Mary dying on the same day are 1/3650. 1/48,627,125,000 or nearly 50 billion to one! Of course these sums can't be perfect, especially regarding the wedding date. Also we've ignored leap years (which didn't actually exist in great Britain until 1752), plus the chances should be even longer bearing in mind they both reached an age of 80 years which would have been exceptional at the time. a mathematical sensation, you deserve it! King Charles 1 became the only English monarch to be executed as Oliver Cromwell took over the country. King Charles II (The Merry Monarch) took over the throne. The Great Plague killed over 100,000 people in London and the South East.